This is a hybrid 4-wheeled vehicle powered by a combination of a liquid-cooled V-twin gasoline engine and an electric motor. It is also designed with a unique dual-scythe suspension that enables cornering with a lean (banking) like a motorcycle despite the 4-wheel format. There is also a dual arm-lock system that keeps the machine upright when at rest without a stand. 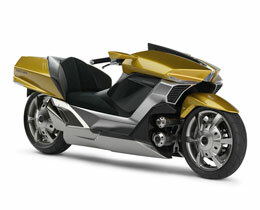 With a machine width roughly equivalent to that of a 2-wheeler for great maneuverability and space saving, while offering excellent stability, the environmental performance of a hybrid and more, this is a model that Yamaha will continue to conduct research and development on as a revolutionary "premium vehicle" for the future. With the look of praying mantis arms and a unique design, this suspension makes possible motorcycle-like banking in the turns. Since all four wheels remain on the road surface, the result is a dynamic ride with good stability. The link support mechanism of praying mantis-like arms (upper) is fitted with a lock system that supports the machine in the upright position when parked so it stands independently. 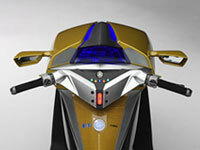 This is a hybrid type motorcycle with a gasoline, liquid-cooled engine and an electric motor that function in parallel to provide a riding experience that could never be achieved with only an engine. Drawing on Yamaha's "G.E.N.I.C.H." ideal of electronic control technology use and our "Smart Power" concept of employing new power sources, this model offers a new sort of rider-machine communication. During acceleration the electric motor kicks in to assist the engine and when cruising the motor switches to a generating function to re-charge the battery. The engine-brake force created during deceleration is also used to generate electricity to charge the battery. Yamaha's super-thin YIPU (Yamaha Intelligent Power Unit) is built into the rear hub to provide the electric power assist during acceleration and when wheeling the vehicle by hand, and it also provides a reverse function. 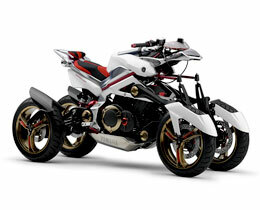 In a collaboration with Yamaha Corp. (music) this model also mounts a special audio system,"Natural Sound Motorcycle Audio System." Sound is projected in beam form to create an ideal sound for the rider. It is compatible with a variety of sound systems, and can transmit sound to a wireless receiver in the helmet via BluetoothT technology. Also, the helmet has a built-in active noise canceling function to reduce annoying wind noise and improve the sound environment in the helmet.